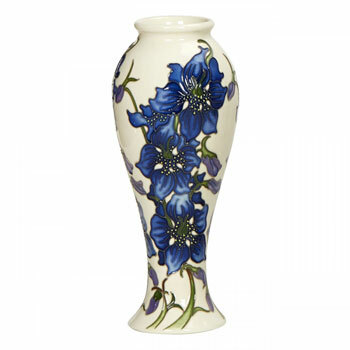 Moorcroft Delphinium Vase 75-8 Discounts Apply ! Derived from the Latin for ‘dolphin’, the fragile Delphinium naturally twists and curl in the wind, and looks lovely in this Blue Form. Designer Kerry Goodwin uses deeply lobed leaves to create tiny green ripples in waves that rise from the base of the vase and surface at the neck.